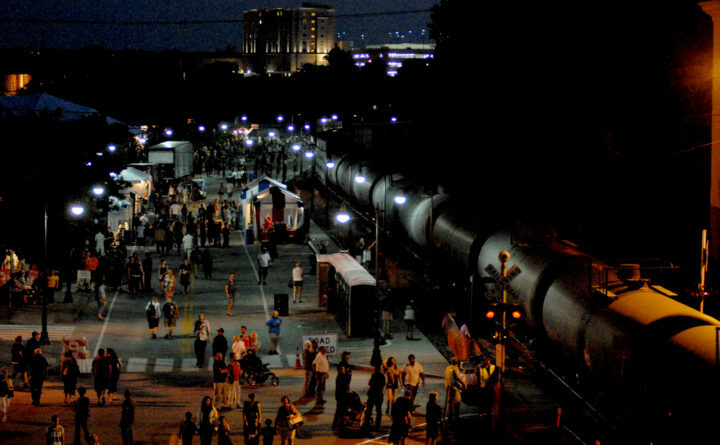 A train passes through the American Folk Festival in downtown Bangor in this Aug. 25, 2012, file photo. 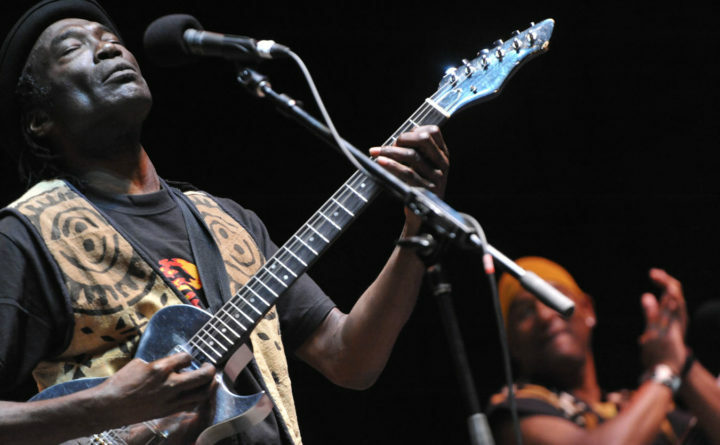 Congolese musician Samba Ngo, left, mezmerizes the crowd at the Railroad Stage at the American Folk Festival on Bangor's waterfront Friday evening, Aug. 26, 2011. Robyn Metcalf (from left), 15, Shannon Hardy, 15, Sierra White, 15, and Robyn's sister Kyra Metalf, 16, all of Massachusetts, carpooled to Bangor to soak in the bluegrass band Rich in Tradition and other attractions at the American Folk Festival. 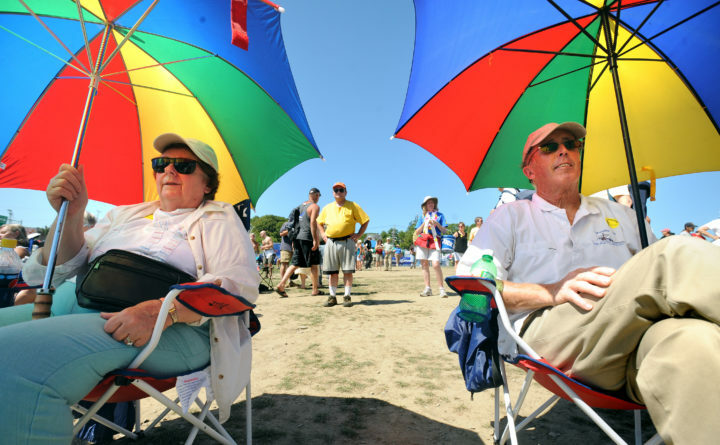 Madeleine Drummey (left) and her husband, Don Drummey, of Canton, Conn., listen to the Holmes Brothers at the Railroad Stage during the American Folk Festival on the Bangor Waterfront. 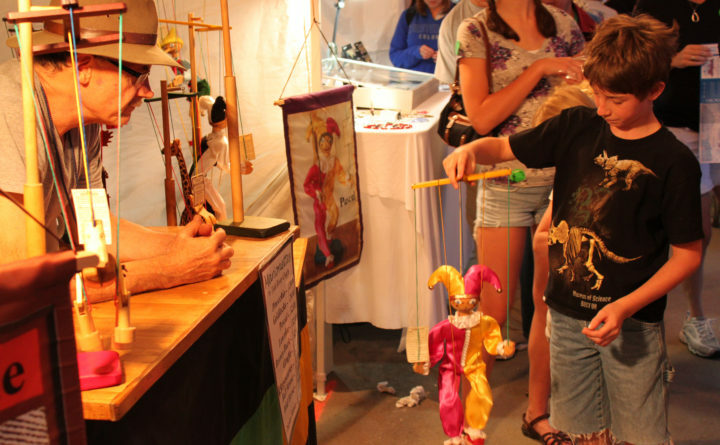 Craftsman Mark Aman, owner of Fish River Crafts of Fort Kent, teaches a boy to move a handcrafted marionette at the American Folk Festival on the Bangor waterfront. Twenty years ago, the Bangor waterfront was not much more than a dumping ground — an unkempt swath of land containing little but the remnants of long-gone industries. Today’s waterfront is a far cry from that bleak industrial landscape. It’s now the site of a riverside park, a 16,000-seat concert venue, an array of food trucks, an increasingly busy marina and the corporate headquarters for one of Maine’s largest employers. It’s also home to the American Folk Festival, the 14th edition of which kicks off this Friday. It was the festival, which originally began in 2002 as the National Folk Festival, that first made people in the Bangor area believe that the waterfront was not only worth reviving, but could also become a tourist destination. But as the waterfront has changed, so has the folk festival — a little. Is it keeping pace with the growth around it? 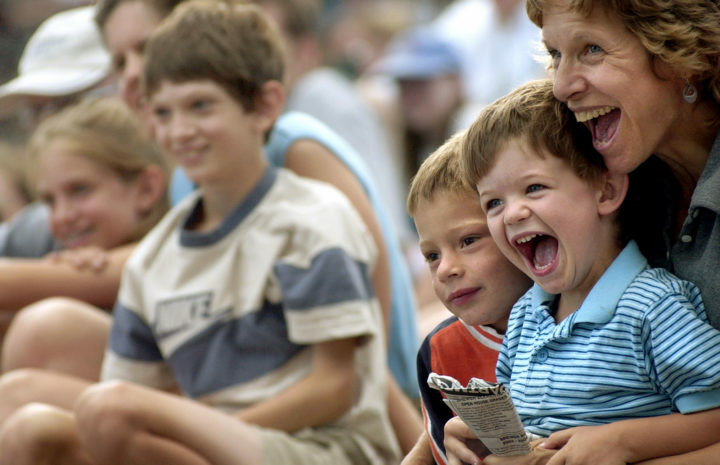 Laura Cowan (right) enjoys John Styles' Punch and Judy puppet show with her sons Alec, 6, and Cole, 3, in this BDN file photo. Back when it first started, the folk festival was one of the only gigs in town. Barry Bergey, who for 30 years was the director of the National Endowment for the Arts’ Folk & Traditional Arts program before retiring in 2013, recalled the mild trepidation with which the National Council for the Traditional Arts eventually chose Bangor for the National Folk Festival’s three-year run in 2002, 2003 and 2004. For many residents of the Bangor area, those early years were eye-opening experiences. The seeds planted back then have indeed blossomed. The waterfront is now a major tourist attraction, and the nearby downtown district has grown, alongside the opening of Hollywood Casino and the Cross Insurance Center. Amid major artists playing at the Darling’s Waterfront Pavilion, local music series such as the New Nashville North Concert Series and Bangor Celtic Crossroads, and more than 20 new eateries opening in the past five years, Bangorians are not want for options for things to do, hear, see, eat and buy. Longtime AFF executive director Heather McCarthy knows that the landscape in Bangor has changed. She’s undaunted, however, in her belief that the festival offers something that nothing else in the area can — and that it’s actually gotten better for them. 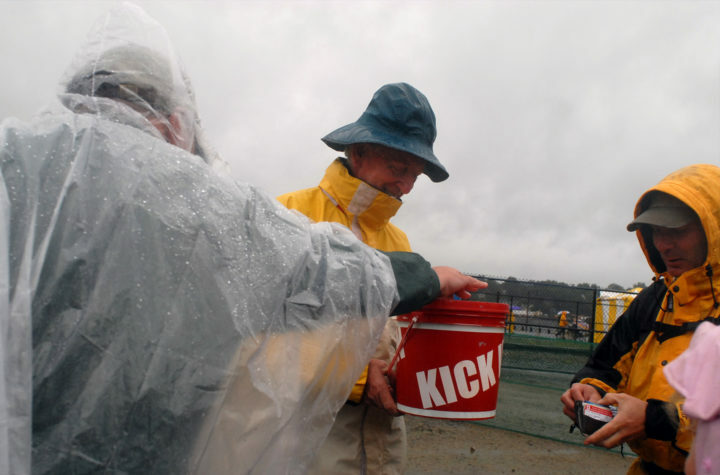 Volunteer Mark Eggleton collects donations at the 2009 American Folk Festival. It’s been more than a few years since the festival has attracted the staggering numbers once cited between 2002 and 2008 — more than 150,000 people over the course of three days, with highs of 165,000 in 2006 and 2007. After a dismal 2009, when torrential rain on the Saturday of the festival severely dampened attendance, numbers have gradually decreased. The last time official attendance numbers for the AFF were released was 2012, when around 90,000 people attended. According to Dan Cashman, chair of the festival’s communications committee, the AFF has since 2013 relied instead on general estimates for each year’s attendance, which he said has remained relatively steady at around 90,000 every year since. Donations pulled in by the bucket brigade have also remained steady, hovering around $100,000 each year. The AFF no longer has a contract to work with the National Council on the Traditional Arts to book artists for the the festival — since 2017, it has booked its own talent. Now that they can book as they please, McCarthy said she’d love to see a “bigger name” artist as a de facto headliner, but that as always, funding can be hard to come by. The perennial challenge of fundraising hasn’t gotten any easier over the years, but neither has it become more challenging. McCarthy said the festival has a very reliable base of boosters that include individual donors, Maine businesses and national corporate sponsors, which, when combined with the bucket brigade, pulls in nearly $1 million each year. Nevertheless, dollars for programming, marketing and other new initiatives are precious. There’s always the option to introduce a mandatory fee or ticketed element for part or all of the festival — but McCarthy says while it is regularly discussed by the festival’s board of directors, it hasn’t been seriously considered. 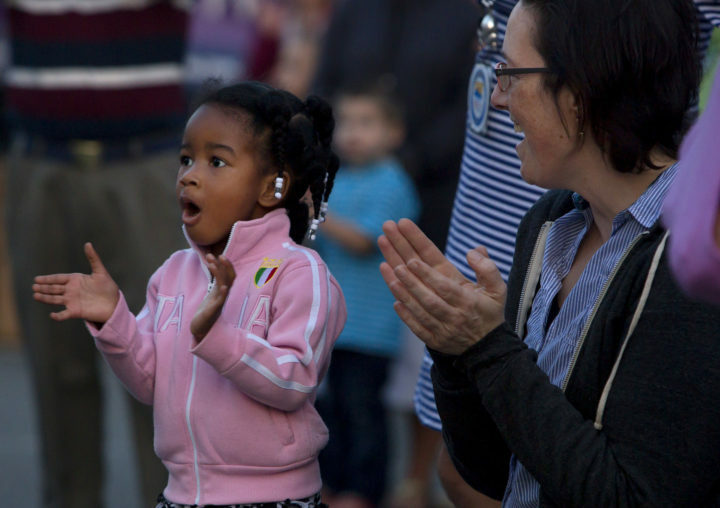 Sophi St. Louis (left), 3, and Date Van Dine dance while watching the Pride of Maine Marching Band during the opening parade of the 2017 American Folk Festival at the Bangor Waterfront in 2017. Other festivals across the country have evolved over the years. Johnstown, Pennsylvania, which hosted the National Folk Festival from 1990 to 1992, launched their own event, the Johnstown FolkFest, which ran from 1993 through 2008. In 2008, the city renamed the event the Flood City Music Festival, started charging admission, and expanded its lineup to feature bigger name artists, such as Grace Potter and Blues Traveler — while still featuring traditional folk festival-style artists. Others folk festivals haven’t fared as well. The Great Lakes Folk Festival in East Lansing, Michigan, which developed from that city’s hosting of the National Folk Festival from 1999-2001, was canceled this year, and its future remains uncertain. 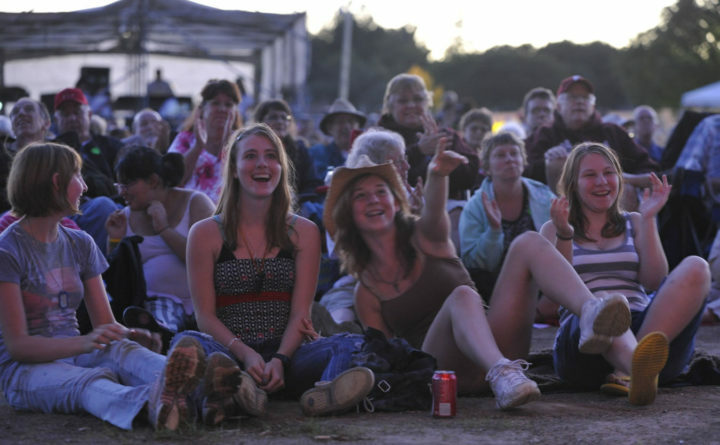 Still others have, like the AFF, largely hewed to the format created by the National Folk Festival. 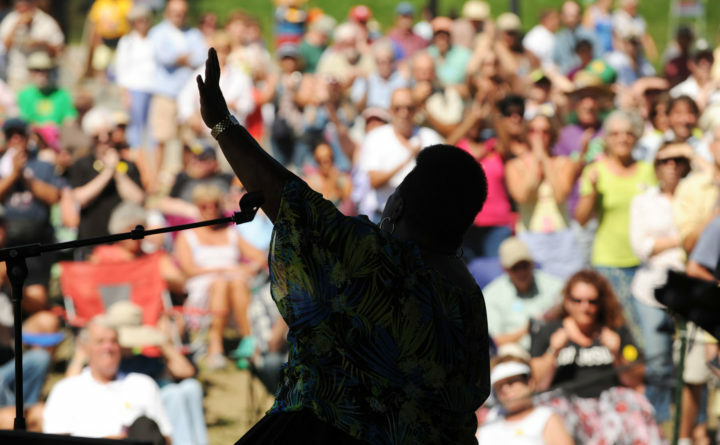 The Lowell Folk Festival in Massachusetts, the Richmond Folk Festival in Virginia, and the Montana Folk Festival in Butte, Montana, all feature many of the same artists on their 2018 lineups, such as Colombian ensemble Tribu Baharu, rockabilly artist Linda Gail Lewis, and Annika Chambers, a blues singer who will also perform in Bangor this year. One thing that’s likely set to change in the next two years will be the location of at least one of the festival stages. The city is currently planning sometime in late 2019 to begin long-delayed construction on a $22 million wastewater storage tank, to be installed in the area behind the Tim Horton’s on Main Street. Bangor wastewater treatment officials said that construction of the facility will likely not require moving the Dance Pavilion from its current location, but that it definitely will require it to move for 2020. It’s not the first time a stage has moved — in 2008, the Dance Pavilion moved from where the Penobscot County Courthouse is now to its current location behind the Darling’s Waterfront Pavilion, and in 2013, the Railroad Stage moved to accommodate the pavilion again. Regardless of how the festival looks, what the weather is, who’s playing, how much money is donated or any of the other variables, this weekend, the tents, booths and stages are set. At 6 p.m. Friday, New Orleans jazz band Tuba Skinny will lead a parade down Front Street toward the Railroad Stage. The smell of kettle corn will waft through the air. St. George’s Greek Orthodox Church will cook up gyros and souvlaki. Musicians from all across the world will play all weekend, whether it’s for dancers, quiet listeners, or revelers in beer tents. Whatever the future holds, this weekend, it’s American Folk Festival weekend in Bangor. The American Folk Festival runs from Friday, Aug. 24 through Sunday, Aug. 26 on the Bangor Waterfront. Suggested daily donation for a family is $20. For a full schedule of artists performing, visit americanfolkfestival.com.